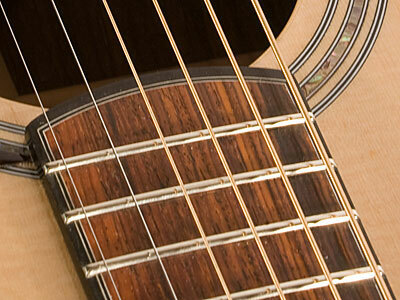 Fingerboard inlays on the fretting surface range from none, to simple position markers, to very elaborate inlays. 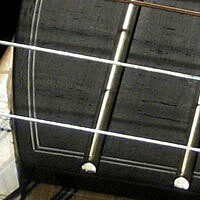 One issue to keep in mind when contemplating a fingerboard inlay is future fingerboard and fret work. A heavily played guitar will occasionally need its frets replaced and potentially the fingerboard to be sanded due to wear. An elaborate inlay can be damaged during these operations. A nice compromise is to place an inlay in the upper fret locations where the amount of wear is typically much less. The following image show various fingerboard surface inlay options. Custom options are available as well. My standard fingerboard surface inlay is fairly simple. The only inlay I do on my standard fingerboards is an alternating white/black/white strips near the edges of the fingerboard, mitered to a terminating curve at the end of the fingerboard. The contrast between the dark fingerboard wood against the gold colored frets present a simple elegance. The strips run through the complete thickness of the fingerboard, so wear and future fingerboard fretwork will not be an issue. The Lone Wolf Guitars Flower and Vine Inlay is an intricate combination of various inlay material. The delicate inlay-within-inlays requires the utmost patience and precision. 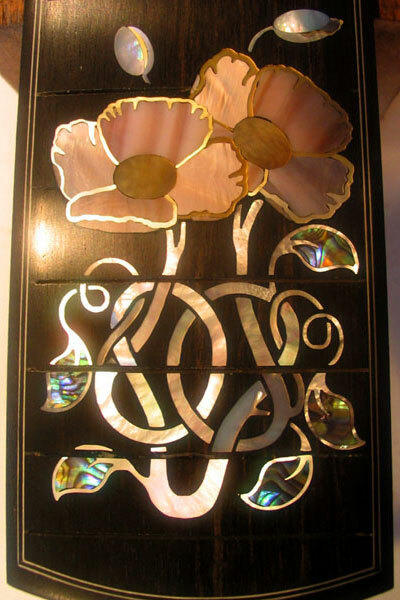 The result is striking inlay of intertwined vines and flowers. The inlay materials used in the image above are as follows. Other combinations of inlay material is available as an option. The Lone Wolf Guitars Lightning Inay runs the length of the fingerboard. It is made White and Gold Mother of Pearl. Contrasted against the black Ebony fingerboard, the lightning "lights up" as it reflects light from various angles. ©Copyright 2004 Lone Wolf Guitars. All rights reserved.